Japanese Episode DP 163: "An Explosive Evolution! Goukazaru!!" American Episode 1306: "Fighting Ire with Fire!" On their way to Nagisa City, Satoshi and his friends meet up with Jun. The trainer from Futaba Town reveals that he's already gotten all eight badges and will be competing Shin'ou Pokemon League. Later, at the Pokemon Center, our heroes are surprised to run into Shinji. Jun's excitement at meeting his idol fades when his invitation to a battle is rejected, but he quickly recovers and asks Satoshi to battle him instead. As our heroes leave the Center to begin their battle, a television broadcast reveals that the Grand Festival will be held in Risshi Lake. Outside, Jun sends his Empärt out to face Satoshi's Moukazaru. Empärt's Hydro Cannon sends Moukazaru flying off into the forest, but before Satoshi can run after it, the Rocket-Dan appear and trap everyone in giant spheres! With the trainers incapacitated, the Rocket trio is free to gather their pokemon without any interference. Suddenly, Moukazaru returns, its Blaze ability out in full force! After his pokemon disposes of the Rocket-Dan, Satoshi notices that the leftover mecha is threatening to crush the still-imprisoned pokemon! 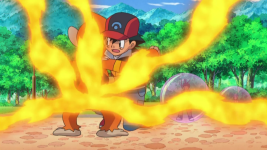 Shinji appears and uses his pokemon to prevent it from collapsing while Satoshi tries his best to calm his fire-type pokemon. Eventually, Moukazaru evolves into Goukazaru and uses its newfound strength to save the others. After Satoshi thanks Shinji for his help, Shinji tells him that his brother wants them to have another full battle. After promising to battle Shinji in the Shin'ou League, Satoshi sets off toward Nagisa City to earn his eighth Gym Badge. I like evolution episodes where the change isn't the only thing going on in the episode. In the past, the writers were all too happy with taking an absolutely pointless episode and shoehorning an evolution into either the beginning or the ending of the episode. They don't really do that so much these days, and it's one of the (many) reasons I like Diamond & Pearl so much. This episode had a lot jam-packed into it, but it managed to handle everything without appearing too strained. We find out the status of Jun's quest (and also, that he got two badges since we last saw him six episodes ago), where the Grand Festival will be taking place, and the fact that Musashi still has a chance of qualifying for said Grand Festival in time. We also finally see Jun and Shinji meet for the first time, something the former's been talking about since his debut episode. As packed full of content as this episode is, it never feels unnatural or forced to me, and I wish every episode could juggle so many things as expertly as this one does. I know I've been praising the recent batch of episodes a lot, but what can I say? I really like this part of the series. The dubbed version removes most of the Japanese music from this episode, I guess to make up for all the music we got in the previous episode. Is that even worth bringing up anymore, I wonder? Other than that, I'm still not a huge fan of Barry's English voice, but it's starting to grow on me a bit. His "I've got the advantage~" bit right before the main commercial break was so unexpected that I don't know whether to cringe or shake his voice actor's hand, but it definitely made him stand out. Meowth: "I'll bet it's all those pesky blast offs!" James: "Cease! I have the floor! Ergo, we need to reverse our train of thought." Meowth and Jessie: "Please, no more trains!" "No more trains?" So what, Team Rocket has some kind of history with trains now that we're supposed to be familiar with? Originally, Kojirou told his teammates that they need to rethink their strategy, prompting the other two to say that they don't know what he means. James: "It's Operation: Train in Reverse!" Jessie: "Ooh! The joys of traveling by train." Meowth: "We'll be known as the little Team Rocket that could." Again with the trains! Am I missing something here? In the Japanese version, Musashi calls her friend "smart" and Nyasu says that they should get started on that plan right away. Barry: "Hi! Your name's Paul, right?" The dub neglects to mention that Paul is from Veilstone City, a tidbit that the Japanese version includes. One of James' lines in the Team Rocket motto is different from what it usually is ("A two point landing, now isn't that neat? "), but the motto in the Japanese version is the same as it always is. When Moukazaru evolves into Goukazaru, the fifth opening theme to the original Pocket Monsters series, Ready Go!, is used as background music. It plays from the moment Moukazaru bursts out of Satoshi's arms until Hikari looks it up on her Pokemon Zukan. The dub uses instrumental background music that really doesn't highlight the importance of what's happening on-screen. Because it's not like this is a huge moment in the character's development or anything.